Are you frustrated with your MLM sponsor and thinking about switching to a different upline? At some point in our business, we look to outside sources to blame for our own lack of success. It’s natural to pass the blame to others, especially a terrible MLM upline. But blaming a terrible MLM sponsor can get in the way of your progress. While it can make you feel okay about not putting in the effort required for success, blaming others or depending on them is no way to build a successful network marketing business. After this post, you should know 3 different ways that you can handle a terrible MLM upline and why you don’t need your upline in order to build a successful network marketing business. 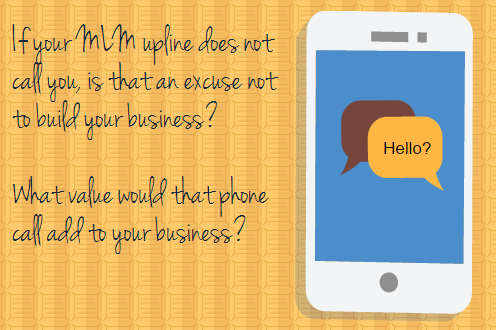 If your MLM upline does not call you, is that an excuse not to build your business? What value would that phone call add to your business? If you insist on speaking to your MLM sponsor, can you call or send a text message? The bottom line is this: if you decide to not move forward with your business because your upline did not call you, that is your responsibility. If it’s a matter of getting some questions answered, there are numerous ways to find the answers. And, as a business owner, you should learn to be resourceful. You can contact your company distributor customer support, check the FAQ, or post a message in the distributor Facebook group. You can also contact the MLM upline leadership above your direct sponsor. Remember, this is your business so take responsibility and stop making excuses. 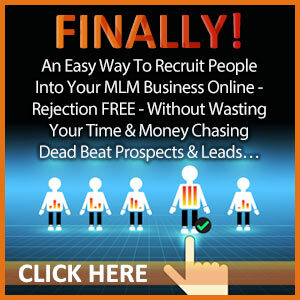 Are you thinking that you will be successful in your network marketing business if you change your MLM upline? I’ve seen this many times and usually, the person is no more successful with a different MLM sponsor. For example, I’ve seen distributors quit for 6 months, excitedly waiting to join a better MLM sponsor. Then that magical day comes. They enroll with the best and most successful MLM sponsor in the company and BAM! They experience no more success than they did with their previous sponsor who sucked. The reason is that it’s up to you to succeed, not your sponsor. Your sponsor is not responsible for your success, you are. For example, there is an ample amount of training in your distributor online office, regular company calls and events. You should be using these tools on a regular basis to learn how to move forward with your business. 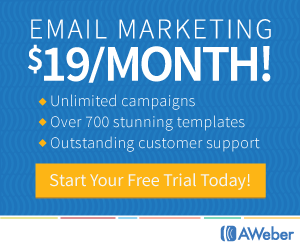 In addition, you can click here to learn how to sponsor and recruit to grow your business. Are you lacking mentorship from your MLM upline? Poor you! 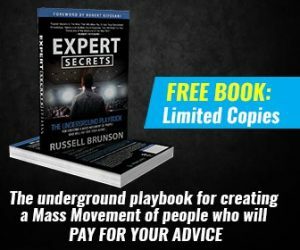 If you really want to grow a successful network marketing business, then seek mentorship elsewhere. For example, I found the best mentors through videos, books and events. There are many leaders that you can learn from, like Darren Hardy, Eric Worre, ntwrkr Magazine, Jim Rohn and much more. When was the last time you registered for a generic network marketing conference or attended an online training? For example, I attended the Network Marketing Pro conference with Eric Worre several times over the years as well as online webinars with Darren Hardy. They are some of the greatest leaders in our profession. There are many resources available to you. Again, as a business owner, being resourceful is your most valuable skill. Blaming your lack of success on your MLM upline is just an excuse. You should not make decisions concerning your network marketing business based on your MLM upline. You are responsible for you own success. 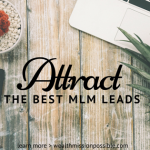 While having an amazing MLM sponsor is positive, relying on that person for your own success can actually prevent you from developing your own personal leadership abilities. Instead, make it a goal to grow a successful network marketing business regardless of who your MLM upline is or what type of leader they are. The number most important skills you need to succeed in network marketing are responsibility and taking action. Using your MLM sponsor as your excuse for not moving forward is not responsible. You can be successful regardless of whether your MLM upline is a terrible leader or a great leader. It’s all up to you. If you are stuggling to sponsor people into your business, this might be the best training on sponsoring people into your business I’ve ever seen. And it’s FREE! CLICK HERE! Ultimately people have to take responsibility for their business activities and their results. That said, there are some lousy sponsors out there. If a rep ends up with one of them, she/he should go upline to find the extra level of support. 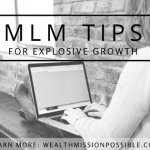 MLM is something I’m looking to get a better grasp at and maybe try (if things turn out less busy for me later this year)…your article is thus apt at this moment in time. You write brilliantly, and most importantly, in a no B.S manner…sincerely, I’m damn impressed on my first visit here! Do keep up the super awesome work. I had a first hand experience of this when I started. Decided after a few months that it’s not about my sponsor its about me. Thanks for a wonderful advice.